Watering the vegetable garden. Chances are you don’t want to spend much time reading about it, because water is just always there for us. We take it for granted because it comes so readily out of our tap, so we find the topic rather boring. But man, is it ever important, vital for all living things. Go 24 hours without drinking it and we would all become more interested. The fact is, we’re made of it. Throughout the course of our lives, our bodies contain between 50 and 80% water. We know our plants are made of water, too. They need it for photosynthesis and cooling, but what’s often overlooked is that all living species in our gardens need water. And we need them all to be happy, because they determine the success of our gardens. Newly planted seeds usually need to be watered daily unless you have soil that really holds onto water well. Last week I seeded lettuces, greens, carrots and beets, and I’m out there every morning giving them a very light watering. Deep watering is unnecessary at this stage because their roots are so shallow. They just need a little. New plants and trees need watering probably 2-4 times per week – it’s difficult to generalize, because it depends on your soil and climate, but those first few weeks (and really the first year) are crucial. And don’t forget them in year 2! My parents have been selling plants for 30 years, and of course they come with a 1 year guarantee which has taught me that many dead plants are simply caused by lack of watering. It’s important to remember that plant roots need water, not stems. So watering the vegetable garden right around the base of each plant with drip irrigation or even a hose is usually not getting the whole root system, which can stretch several times beyond the drip line of the plant. If your plant’s canopy is 3 feet wide, the root zone may be 6 or 9 or even 12 feet in diameter and it all needs water. We need birds and bats for insect control, fertilization and pollination. They need water. Bird baths are great if you can keep them full. If it hasn’t already been done, I’d like to invent a bird bath with a solar-powered pump to recharge it with water when it gets low. Actually, a gravity-fed system would be even cooler. Is there such a thing? Along with birds, we’d like some frogs, snakes, other animals and maybe even a cat. Many open water sources are good for them – ponds, fountains, rain gardens, or even any type of saucer. Now for the part that isn’t talked about as often. Insects, earthworms and beneficial microorganisms all need water, too. It’s vital for the health of the garden that they have enough water. They make healthy soil and feed and protect plants. And like plant roots, they’re not living only right beside the plant – they’re throughout the whole garden – in the soil and in the mulch. This means that we need to water the whole soil. It’s not a waste of water. It’s essential. So yes, our first step is definitely to improve the water-holding capacity of our soil, and we need to have a good organic mulch that holds onto water, too. These steps decrease leaching and evaporation of water. But if we want a healthy ecosystem and healthy food, we need to provide sufficient water for all living things. 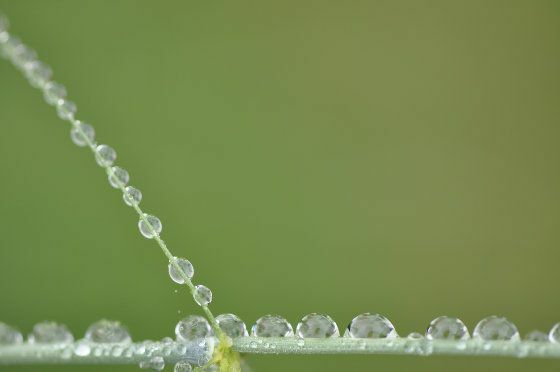 How do you ensure there is water for the organisms in your garden? Yes, it’s definitely nice if we can use rainwater or otherwise dechlorinate our tap water. My allotment plot is about 500 meters from my home and when it does not rain, I really panic. I’d have to drive over, give the garden a good watering and then I can relax, no guilt. I wonder at how that chap Paul G of “Back to Eden” fame does it with only wood chips. He very seldom has to water his garden. He’s probably built up the humus in his soil so that it holds a tremendous amount of water. Plus the mulch conserves water, too. These are definitely some of the first steps in water management. Ya, that sounds like it might work well. Excellent information.!!! very informative and useful. Thank you so much!!!!! Bigfish: I suspect that’s part of why drip works better. More opportunity for the chlorine to off-gas before it hits the root zone. I’d love to see a study of drip irrigation with tap water vs sprinkler irrigation with degassed, soil temperature water. I bet the latter works better. I have saved many a wilted house plant via foliar watering (to reduce the chance of root rot), why wouldn’t it work in the garden too?For my house plants I do this trick I adapted from a master gardener somewhere. The advice was agitating the water to get the chlorine out. You can boil it, run it through a blender, use a spray nozzle (I do this for outdoor plants – garden nozzle + watering can), or let it sit for hours before using it. I drink a lot of tea. Every time I make tea I pour the old water into my watering can, then refill the kettle from the tap. When my can is full it’s time to water the plants (sometimes I have to buy more plants). I water more, and the water doesn’t cause shock because most of the chlorine boiled off, and it’s not cold. Thanks Jason, lots of great tips in there. Would well-water be more beneficial than city water? It certainly can be, but it depends what’s in it. It doesn’t have the chlorine and flouride, which is nice, but it may very well have pesticides, heavy metals, etc. It’s worthwhile to get it tested. Sometimes you can send a sample in for free testing through your municipality. I love the rethinking of what is “water-wise”. In Southern California, we have water police. Unfortunately, little distinction is made between growing ornamentals and growing food. Keeping the area surrounding the vegetable beds moist must encourage the growth of beneficial fungi that’s gotten so much press lately. Thanks for the mentality shift! It’s definitely important to limit water use, as the aquifer that serves much of California is set to dry up in the next few decades, but as you say, we need to provide water to other organisms than just plants. Correct, it’s best not to use chlorinated water. Talking about planting seeds. When I plant grass seed, say to improve a patch what disappeared due to a grub infestation, I also cover the area with burlap. The burlap keeps the moisture from evaporating directly into the air and gets watered before it dries out. The results are quicker and the seeds are more likely to sprout. I just remember to lift the burlap when they do sprout so it doesn’t grow into the burlap or you’ll be pulling your new plants as you lift. I leave the burlap until the new grass is about 1-2″ up. Lifting the damp burlap every day just ensures the plans don’t grown into it is alo easier than watering. Just for the record I don’t use herbicides or pesticides so my grass is a modern-day mix of whatever grows. I understand that sod is full of it. Patches of bare ground need attention especially in front of ones house.Is there something in burlap that I should be wary of? That’s a great idea. Some burlap has dyes or other chemicals in it, while some is chemical free. If you’re using burlap that has something like copper sulfate in it, I’m really not sure how much of that would make it’s way into your soil with a rain or sprinkler water. Thanks Phil. I didn’t know about the copper sulfate. I can only say that my burlap is so old I no longer know where I got it. Whenever it does get replaced I’ll be sure to look for tat detail. Phil, I love your book. Reading it for the second time and recommended it to a number of people. About water…. I want to harvest rainwater from my roof. I’m not sure whether to collect the water in a tank or have it directed to a purpose built pond? I can’t really fund both, so it’s got to be one or the other for now. I like the idea of a pond since I can include aquatic plants and microbes that will help to remove toxins. The question is, how do I get water from the pond to my garden hose? If I have fish and plants in there, how do I prevent them from being harmed as I pump water out to a hose/irrigation system? What would I use to line the pond? How do I prevent evaporation in our extreme Australian Summers? Is it really practical to have a pond or would I be best to simply have a tank and use the water straight from the tank? Or, is rainwater too polluted these days that it really does need to go through some sort of filtration process. Any advice or insights would be greatly appreciated.